53 died Sunday March 31, 2019 in the privacy of his own home. He leaves his wife of 22 years, Carol Jeffery; his daughter, Brittany Jeffery; his son Bryan Jeffery; his son, Cameron Jeffery; his daughter, Mylanna Jeffery ; his fraternity Omega Psi Phi family; and many close friends. Born and raised in Jacksonville ,the son of David Lee Harper and Anna Doris Lawrence. Who from there when on to do 3 years at Alabama A&M. And shortly after enlisted into the United States Marine Corp. He met his wife 10 yrs into his military career. They married in 1995 in a small chapel on Camp Pendleton in Oceanside' CA. They were stationed state side and abroad to include Rancho Cucamonga,Okinawa Japan, Beaufort, SC, Seoul Korea and Fort Bliss, El Paso. 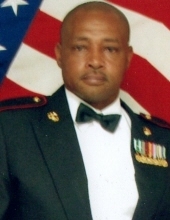 By the time Martin retired from the Corps he had graduated with his Bachelor degree in business. He didn't stop there he went right in to the education field and was an ROTC instructor at Ross Sterling HS in Baytown, TX for at least 10 yrs. He has a brother Karl Jeffery (deceased) another brother Reginald Jeffery, and two sisters Karen Copeland and Anita Bell. Martin loved to be surrounded by family and friends. He was a lifetime member of his fraternity. And was always very passionate as to what they stood for. He was a mentor to the youngsters that crossed his path. If he could help u in anyway he would. John 14:1-4 "Let not your hearts be troubled. believe in GOD;believe also in me. In my Father's house are many rooms. If it were not so, would I have told you that I go to prepare a place for you? And if I go and prepare a place for you, I will come again and will take you to myself, that where I am you may be also. And you know the way to where I am going"
To send flowers or a remembrance gift to the family of Martin L Jeffery, please visit our Tribute Store. "Email Address" would like to share the life celebration of Martin L Jeffery. Click on the "link" to go to share a favorite memory or leave a condolence message for the family.